Venture capitalist Marc Andreessen, Palantir co-founder Joe Lonsdale and Goldman Sachs COO Gary Cohn sat down today at the Goldman Sachs conference in San Francisco, to talk about the thing investors always talk about: Tech. He argued that advances in mobile and chip-making technology signaled exponential expansion of the market. He said tech isn’t overhyped and could have “decades” of growth ahead of it. Echoing economist Carlota Perez’s research, he said world-changing technologies like the web usually settle into a more mature deployment phase after an initial period of hype and investor frenzy. Both Andreessen and Lonsdale said this Cambrian explosion of software and hardware companies like Anki and Oculus VR (both A16z investments) is a boon for big data and security startups. Andreessen was basically repeating his famous argument that “software is eating the world.” So Cohn took a moment to remind him that the financial-services industry was the only thing that Andreessen said software couldn’t eat. Andreessen is famously bullish on Bitcoin. He gushed: “For the first 20 years of the Internet, you couldn’t do this … Bitcoin is the first Internet-native approach of dealing with money. He said that corrupt governments and flimsy central banking systems would be Bitcoin’s true test. “The prospect of a new technology is a big deal once you get out of the West,” he said. Lonsdale used Bitcoin as an example of “how industries work” and “how they should work” and views healthcare and education as some of the biggest targets for reform. “It’s very clear that all these systems were built back in the 70s and 80s. You’re seeing these giant gaps that are being filled in.” He was also weary of social media investments in 2014, because he wants entrepreneurs to make bigger bets. “Is this something that’s pushing the world towards the way it should be?” he asked. Andreessen said we’re in the “deployment” phase. 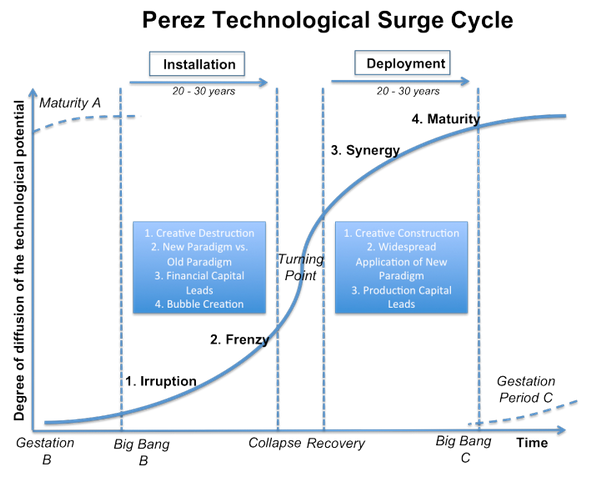 He brought up Perez’s cycle of new fundamental technologies: At first they’re not taken seriously, then way too seriously, then there’s a financial crash and then the same amount of seriousness. Andreessen touched briefly upon recent strife between the tech industry and longtime San Francisco residents. He called recent protests “misguided,” but he seemed sympathetic. When asked by Cohn the loaded question: “When does a venture fund know when it’s gotten too big?” Andreessen again referred to the broad potential of venture investing. “For top tiers, the investable universe is only 100-200 companies,” he said, emphasizing that only about 15 of those are hits. “Perhaps that’s the rate in which the economy can support new ideas. Right now we’ve got 15 good ones, but that number could double and VC would need to increase to support it. I can’t wait to see what the answer is,” he said. Neither can we, Marc. Neither can we.